The excavations began in 1989 during an intervention of requalification of the public garden in Piazza Ferrari. After 18 years, this precious archaeological area has now been rendered to the city. In 1989, during the intervention of requalification of the public garden in Piazza Ferrari a surprising archaeological discovery came to light. The area was restricted to local traffic and enclosed. Several important excavations were executed by Soprintendenza per Beni Archeologici dell'Emilia Romagna with the cooperation of the Archaeological Museum of Rimini during the period from 1989 to 1997. 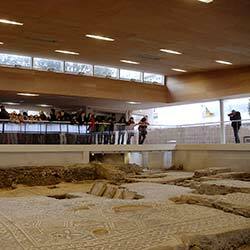 Year after year the uncovered remains provided the picture of an exceptional urban and historical stratification, from the Roman Republic to modern time. The most outstanding element is certainly the Surgeon's House, dating from II century A.D. The large archaeological area covering a surface more than 700 sq. metres also includes the remains of a Palace of Late Antiquity (V-VI century) and an Early Medieval Structure (VIII century) with a necropolis. During the 10-year excavation process, the first find was a brick wall and 3 clay walls. Inside this perimeter a polychrome mosaic flooring was uncovered. Further excavations, near this room, uncovered a smaller section with white and black mosaics. A rich collection of surgical instruments also appeared. It was then clear that a very important archaeological discovery had been made. At that point the project of preservation of the House had to be drawn up. After 10 years of excavation, another 8 years were necessary before opening the site to the public. At last, the project was approved in 2001, when conservation activities began.. An enclosure surrounding the excavation obtained approval so as to preserve the excavation while allowing visitors to enjoy the emotion of the archaeological treasure. The structure is made of steel and a special glass which protects from sun damage , but permits complete and clear visibility from the outside. There is a roof-garden covered with Mediterranean plants interrupted only by openings for air-exchange. Three glass bridge walkways, 2 metres high suspended over the excavations lead the visitors throughout the House of Eutyches! The official opening of the Surgeon's House took place on December 7th 2007.